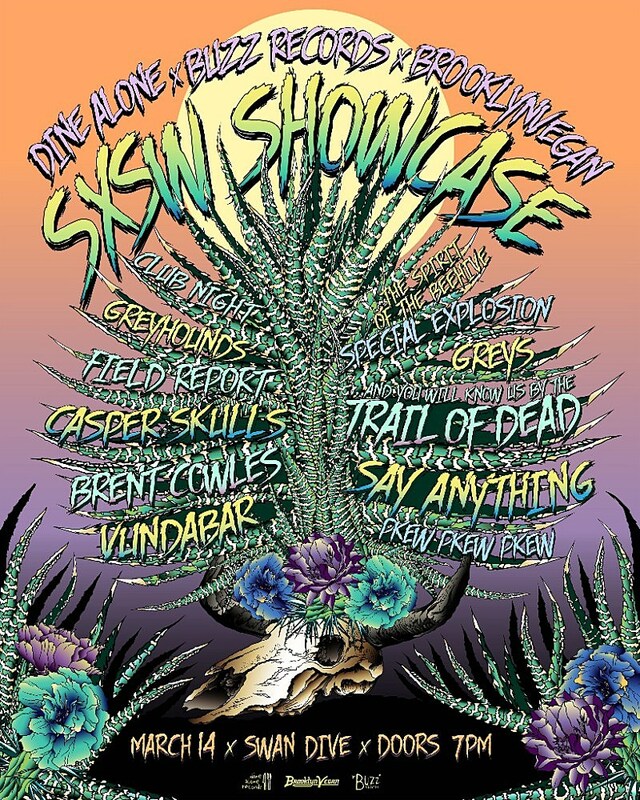 BrooklynVegan teamed up with Dine Alone and Buzz Records for a joint SXSW showcase at Swan Dive in Austin on Wednesday night (3/14). Across the venue’s two stages, the show included recent Dine Alone signees Say Anything (who debuted a new song at the show), Trail of Dead, Greys, Special Explosion, Pkew Pkew Pkew, The Spirit of the Beehive, Casper Skulls, Vundabar, Club Night, Field Report, Brent Cowles and Greyhounds. Pictures of all the bands are in the gallery above. In addition to Say Anything’s headlining mosh pit and crowd surfing-filled set, an obvious highlight was fellow veteran band Trail of Dead (who Say Anything’s Max Bemis praised several times during his set and pointed out he has a tattoo of). They were joined by third guitarist Zach Blair (who has played in Only Crime and GWAR, and currently plays in Rise Against, Drakulas, and the Walter Schreifels-fronted Vanishing Life with Trail of Dead bassist Autry Fulbright II), and Zach helped them sound fuller than ever. Trail of Dead always bring it and this show was no exception. Truly mesmerizing. Another band I was very excited to check out was Seattle’s Special Explosion, whose 2017 debut album To Infinity was one of my favorite indie rock debuts in a while. On the album, they sound like they take after hometown-area vets like Modest Mouse and Death Cab, but live their post-rock side really came through. Very atmospheric and more keyboards than I expected. Also, their drummer is a beast. Elsewhere on the show, The Spirit of the Beehive kicked things off with a very promising set of atmospheric indie rock that sounded a lot more unique than you might expect from that description, noise punks Greys were as white hot and eardrum-crushing as ever, party punks Pkew Pkew Pkew were exactly the pick-me-up you needed when you’re still watching bands at 1:30 in the morning, Club Night had a cool danceable indie rock going on with some Minus the Bear-esque tapping, Casper Skulls’ driving dream pop/shoegaze-ish indie rock was very on point, and more. If you’re in Austin, join us at the four remaining BrooklynVegan shows, including the free day parties at Cheer Up Charlies on Thurs, Fri, and Sat, and our official night show at Scoot Inn on Thurs.